This beautiful book has been at the top of my wishlist for a very long time now, but due to it not being available on the UK amazon website I wasn't able to get it when it was first published. However all that has recently changed as the UK amazon are now stocking it so I quickly ordered myself a copy. You may too have heard a little about this book as quite a few craft blogs posted very positive reviews about it when it was first published late 2008. The book came about from a series of projects that were blogged about at http://www.turkeyfeathers.typepad.com/ all using one wool blanket bought from a thrift store. The challenge to try and use all of the blanket turned out some beautiful items that just make you itch to have a try yourself. My excitement about getting this book was well paid when I got my hands on my own copy. The book is beautiful, well written and lovingly laid out. The how to's at the front are simple and clear and go into just the right level of detail to encourage you to have a try for yourself. Then you have the projects. So many lovely things, where to start? 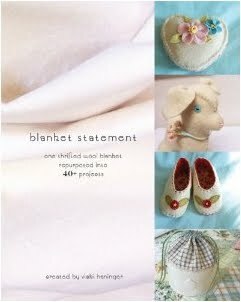 I probably love the little heart pincushion and rosebud booties that you can see on the front cover the most, but then I also love the tiny pony, Eskimo doll, cat nip mittens... in fact I love most of the projects, and that is really rare for me with a craft book. So now I have to decide what to make first. Thankfully most of the projects look very simple and quick so there should be no problems with my being in love with half the book!